So another week and no new item drops for me! Gah! Oh, the frustrations of RNG fail and how any lucky drops elude me. I think at this point I’m consider running my shaman a lot more because loot drops for her all the time even when she doesn’t need it. Really, it’s like a shaman loot shower when I’m out there healing. For my Horde and Alliance warlocks it seems to be a constant nope, nada, zero, zilch, and the small pittance of gold as consolation prize. It really bites when your main never gets a break on good gear. *sighs* I know something will drop eventually, but it just gets frustrating when even something you don’t need doesn’t even drop! Bah! In case you haven’t heard, Fimly’s and Hydra, and the entire TNB crew celebrated their 200th episode over at The Twisted Nether Blogcast this past Sunday night. Luckily, I was able to attend the live show and I’m glad I didn’t miss it. The TNB was the inspiration for me to start this blog so how could I not go and celebrate with them? Sadly, I was a bit late and arrived about 1/2 way through the show, but now I have an excuse to go and listen to everything I missed :) I really do wish them all the best and I look forward to hearing many more. 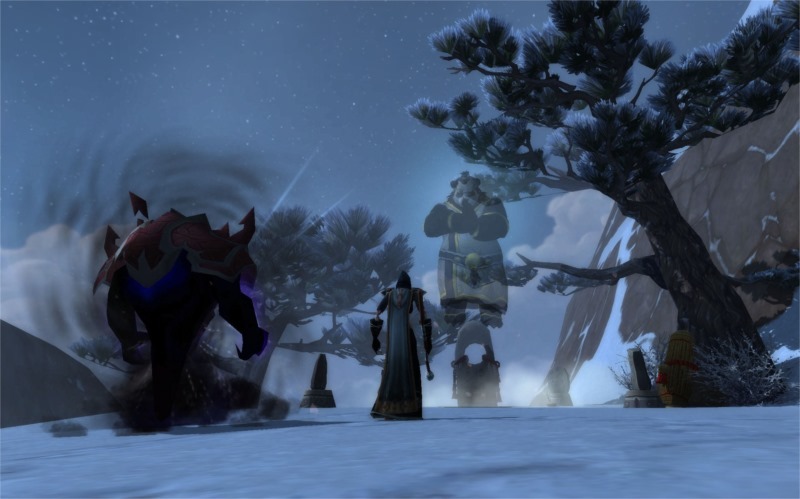 If you’re a WoW blogger and you’re not listening to the TNB, or if you are not signed up over at Blog Azeroth, then stop reading this right now and go get yourself signed up! Then immediately go and download their show! Trust me, you’ll thank me later. If you’re a regular reader then you might remember a few of the times when I talked about when I first started blogging. I wrote to a lot of bloggers who were out there asking for advice on how to get started. Elkagorasa (Elk – as I like to call him) responded back to me and I’m forever grateful. Over at Elkagorasa the Casual, Elk writes about a wide range of topics that can vary from his thoughts about upcoming changes, to things he’s working on, and he always adds his take on how he sees things from his point of view. He’s got quite the sense of humor and if there is one thing I’ve learned from Elkagorasa it’s that you should take your time when it comes to playing and enjoy it for it’s journey. I’ve read Elk’s blog so long that I can’t even remember how I found it, but I’m glad I did. Whether it was a chance encounter or not it left a great impression because I still keep going back to visit. In last week’s post, Elk mentions that he’s been blogging for 6 years now and he’s very close at reaching an amazing milestone of 500 posts! Yes Elk, a few of your posts might be short and have only a few paragraphs, but it is still a lot of work and 6 years of blogging deserves a Meta Achievement or something! I know I’ve been following him for at least 4 of those if not more! Server: Malfurion – US. It’s a central server, but I am in Pacific time zone. How long have you been a warlock? Since Vanilla (October 2006). My friend got me playing and suggested I start as a warlock. They have a pet that helps during leveling, I get the free mount (free meaning the long and painful quest line) and my dark humor seemed to fit. What specs are you currently running? Dual spec, but solely run Demonology. Started as Affliction, then Destruction, but stuck on Demo for now. What’s your favorite specialization and what do find the most appealing about that playstyle? I loved affliction back in the day because of the self-healing. I never really needed healing potions. Destruction was fun in Wrath when the name of the game was speed. How quickly could you burn everything down. Demo is fun now that Blizzard has come back to large mobs of trash everywhere. What’s your favorite spell and why? The Observer (upgraded FelHunter) has a auto-attack ability, Tongue Lash; I think it’s hilarious when a lot of my damage comes from him licking my enemies. My favorite spell was Death Coil, before it became a talent. 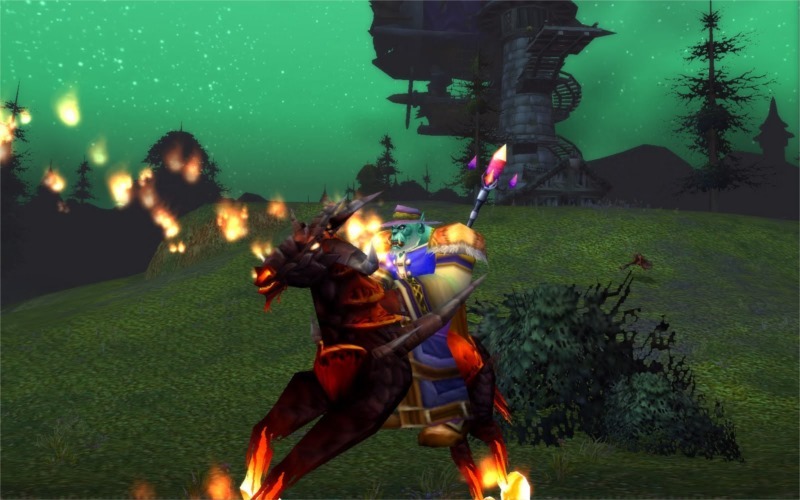 I could be in a situation where I had aggro’d something, PVP melee or the boss in a dungeon, and I could make it run screaming from me, while it healed me in return..
What addons do you currently use besides the basic DBM and Recount? I love addons. It’s addons (IMHO) that make Warcraft so much different than other games I play. Bartender4 – so I can change the location and sizes of my default bars. Reforgerade – for easy reforges based on data from Ask Mr Robot. Vuhdu – mostly for healing, but works as a nice buff (Dark Intent) monitor. TBag by Shefki – A great all-in-one bag that sorts by type of item. Omen – when running Dark Apothesis, it’s easy to out threat the tank. WeakAuras – nice to have pop-ups when certain skills are available big, front and center. BagSaver – auto-sells grey and soulbound, no class gear (good bye soulbound plate). Random Mount – because always running around on the Dreadsteed is boring. Do you prefer using a minion or using the Grimoire of Sacrifice? Right now I mostly run with a minion. I love the AOE of the Wrath Guard (trash) and will swap to the Observer for single-target damage (boss). Which is your favorite demon to command and why? Terror Guard and Abyssal because they no longer need to be maintained. He simply disappears when the fight is over. Do you use any macros and if so which one? I have 3 macros that I use all of the time. I used to have quite a few more, but never updated them with MoP. Macro 1: Easy Healthstone. This is a three way macro. Click with no modifier, it uses a healthstone, hold down SHIFT, it creates the group soulwell, otherwise while solo, I can create a personal healthstone by holding down CTRL. Macro 2: Easy Warlock portal – This allows me to have one button do both a summon portal and to teleport. Holding down a modifier key (alt, ctrl, shift) will activate the summon function, otherwise I seel the teleport image and cooldown. Macro 3: Fear This! – This macro was used more in Cataclysm than now, but still fun in PVP. Select a target, then click this to fear them. Swap back to my old target. The feared target is set as a focus, so I can continue to fear them without losing my current target. Your most (favorite / embarrassing / funny / proud / memorable) moment while playing your warlock was? 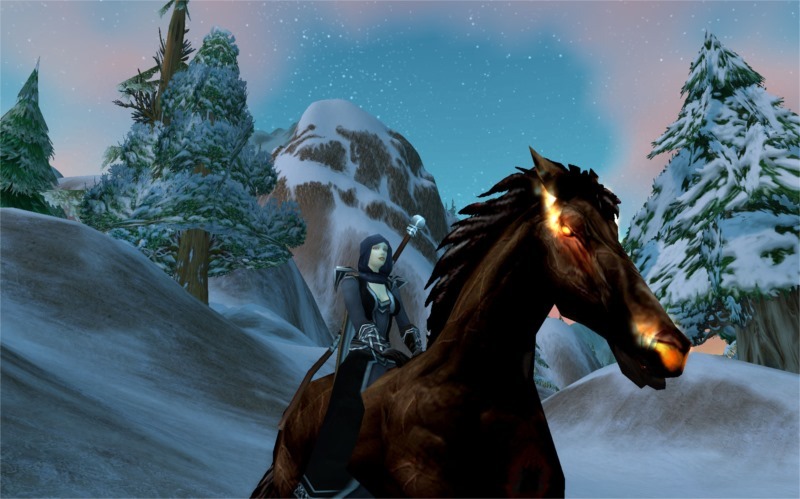 (Feel free to use more than one) Most memorable WoW moment would be the time that I tamed my felsteed. I had spent weeks finishing all the pre-requisite quests and gathering the mats. Of course I was about 5 levels behind everyone else in my guild so the fight was rather easy for them, but I appreciated their help. What flavor are your warlock cookies (examples: Chocolate Chip, Carmel, QQ Mage Tears, Spicy Hawtness)? Snickerdoodles. I take glee in knowing that my warlock cookies are created from the souls of dead enemies. What is your favorite dungeon or raid boss, or PvP battleground and why? Lich King would have to be my favorite raid boss as he was the first raid boss I had actually seen at level. I am such a casual player that every other boss fight was after it was stale for everyone else and we were just about to get a new expansion. What is your least favorite spell and why? Eye of Kilrogg – This spell is fairly useless. I summon a flying eye to peek ahead. Why do I care what’s ahead? If I am in a group, I have a tank to take all the damage. If I am solo, I am probably headed that way anyways. I like that they glyph’d this spell in MoP to have the Eye place portals, but I have yet to use it. Use the Eye to sneak behind PVP lines, then drop a portal. Meh. If you could make up and give your warlock any title you wanted, what would it be? (examples: The Heartbreaker, Purveyor of Pain, The Uncaring, the Unforgiving) The Casual – I remember when as a “casual” (non-tier raiding) player, it was looked down on. In the last 2 expansions, Blizzard has finally realized that the real long term players are those who aren’t going to get burnt out playing WoW 20 hrs a week, but slowly and surely gear up. Sure I want to see and play everything, but LFR is absolutely enough commitment. What do you like most about playing a warlock? Playing DPS. I have a Discipline priest that I used to play more when the DPS queues were enormous. I waited 45 minutes for this dungeon to pop and the healer is lousy! Healing is a thankless job that people love to complain about when they aren’t getting healed. Heals?? Yeah, maybe if you weren’t standing in the fire the entire fight. Panda with it’s 3 ways to queue, I never wait to play. I could run scenario -> dungeon -> raid if I wanted. No one really complains if your DPS is too low when you’re topping the dps charts for most fights. If you could add, change or remove with regards to the warlock class what would it be? In the beginning, I used to feel ‘bad’ about not having a nice buff to share with anyone. Sure we could soulstone in raids, but no real buff. Ah that friendly Priest dropped a Power Word Fortitude on me!! How nice.. Then Blizzard gave us “Dark Intent” but we had to pick our best buff buddy. Pick the wrong player and your DPS would be severely impacted. Now in MoP, Dark Intent is a group wide buff that get’s overwritten by another buff, Paladin, IIRC. Wait, am I playing a Pally now?? Let’s drop Dark Intent as a group wide buff and let use maintain it only for ourselves..
Do you have any tips you can offer for newer warlock players, or to those who are new to your main specialization? Don’t be afraid to put on PVP gear if it improves those questing greens you have. Warlocks can be solo players. We have minions who can be mini tanks, agro monsters or mana batteries. If played right (and geared right) you can solo a lot of content. Sure we can’t wear plate, but how many other players can turn themselves into a demon that has fire at their feet and wings on their back. Demonology is a lot of fun, especially now that we can call a small army of imps to shoot fireballs. Use them whenever they are available! Don’t burn yourself out playing too much. It is easy to get too absorbed in this game and then burn out. Most my friends ‘quit’ playing because they were raiding 10-12 hours a week. This meant getting materials, looking for upgrades at other times. Don’t feel bad not buffing other players. Go play a healer class if you want to be yelled at for not handing out the buffs. You yank monsters from another realm and control them to do your bidding. That should be enough satisfaction. If they complain, feed them warm slightly sweetened souls. Ask for help. We’re a band of DPS dealers. Amijade and myself are more than willing to post something that might be helpful. How can readers get in touch with you? The best way to find anything about me would be my blog at www.Elkagorasa.info. I’ve been posting there about warlocks, gearing up, achievements and other WoW news since 2010. 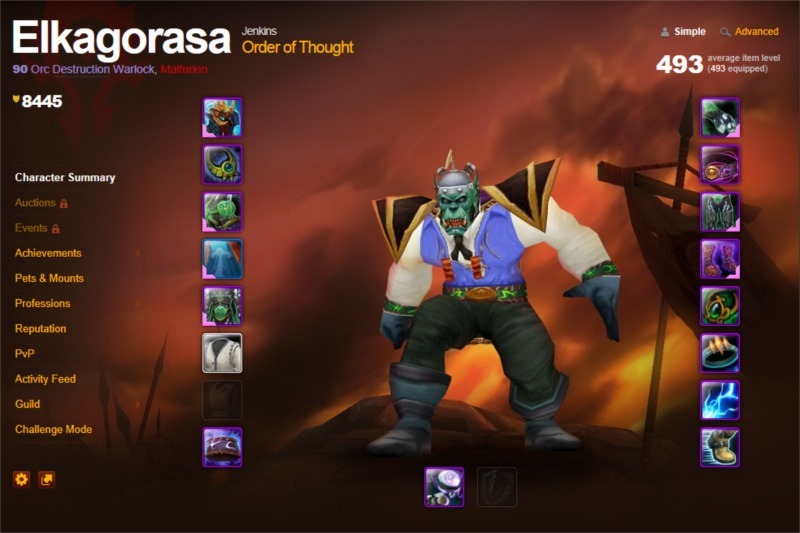 Lately I’ve been posting a bit about my adventures in getting level appropriate gear in order to hit the Terrace of Spring LFR. I didn’t even know there were this many Warlock bloggers. LOL! :) There used to be more, but as the game has aged, the numbers have dwindled. BTW, that felsteed image was a PAIN to capture. run + change view + clicking print screen. IIRC, I had to use my nose! I’ve created a linked page if you want to download those add-ons from Curse here. No worries! I just know that hitting that number of posts is huge! Gratsie! That really is quite a milestone! I hope the snickerdoodle cookies are served warm too? Fresh from the oven? Like Elk mentioned, there’s not a lot of us out there. For those that have been doing it more than 2+ years it really dwindles down. I think blog burn-out and the decline in Cataclysm really hurt the numbers to a large degree. I’ve just rolled my first Warlock, so this was useful – thanks! Now my only question is this Mr. or Mrs. Wow? If there’s anyway I can help, just let me know :) Grats on rolling warlock! Now you just need to find your own cackle laugh style! Warlocks really are the best class, coming from someone who has played a warlock as my main since 2008. They may never best mages in terms of firepower, but their utility is still unparalleled. What would anybody do without their rocks and portals? Nothin, that’s what. Best part about warlocks is that even after all these years they still have a very steep learning curve. There are very few talented warlocks in the endgame department, and it’s rare to find a guild that isn’t recruiting one. If you can become one of that percent who knows their class, it’s a great sense of pride. Don’t listen to that mage sympathizer! Stick with that warlock! I know I agree with everything you said :) Also, I loved the post you did about adding personality and not being a stereotype. If you don’t mind, I’m gonna toss a link out about it. Thanks for stopping by!